1. In a mixing bowl, add 120 grams all purpose flour, 120 grams wheat flour, 1/2 teaspoon salt, 1 tablespoon oil, 180 milliliters water and knead it into a smooth soft dough. 2. Rest the dough for 30 minutes. 3. Take a skillet, add 1 litre water, 230 grams pasta, 1/2 teaspoon salt, 1 teaspoon oil and mix it well. 5. Remove it from heat and drain the pasta. Keep aside. 6. Heat 2 tablespoons oil in a another skillet, add 1 tablespoon garlic and stir until it turns golden brown in color. 7. Then, add 65 grams onions and fry till translucent or until it turns golden brown in color. 8. Now, add 150 grams bell pepper and mix it well. 10. Add 155 grams tomato puree and mix it well. 11. Add 1 teaspoon salt, 1 teaspoon black pepper, 1/2 teaspoon chilli flakes, 1 teaspoon mixed herbs and mix it well. 12. Cook for another 3 - 5 minutes on medium heat. 13. Then, add 2 tablespoons tomato sauce, 50 grams pasta sauce and mix it well. 14. Now, add boiled pasta in it and mix it well. 16. Remove from heat and keep aside. 17. Take a ball from dough and dust it with flour. 19. Place it on a hot tawa and cook for 2 - 3 minutes on moderate heat from both sides or until it turns golden brown in color. 20. Brush one side of it with oil. 21. Remove it from heat and place it on a board. 22. Spread ketchup on it. 23. Add the prepared pasta on it. 24. 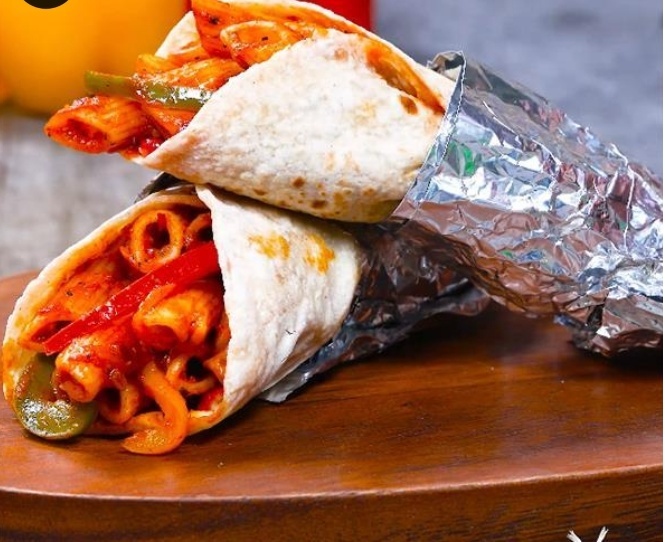 Roll the chapati and cover it with aluminium foil.